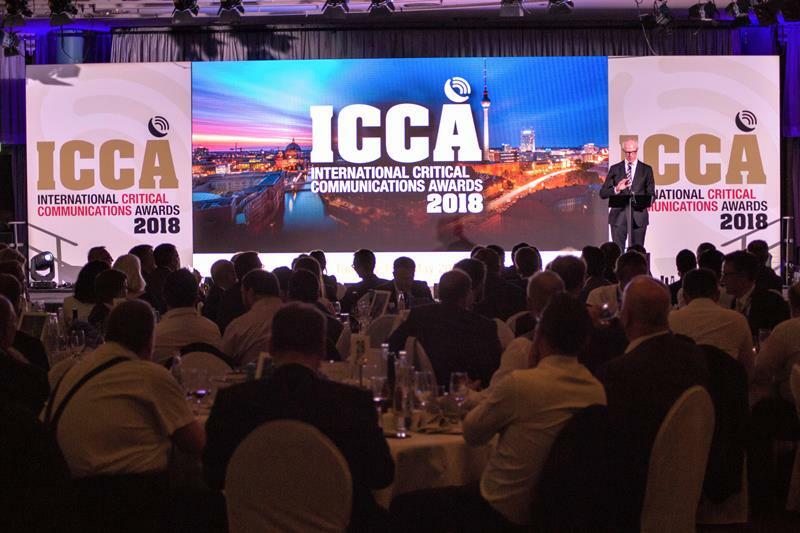 The International Critical Communications Awards (ICCAs), organised by MA Exhibitions in association with TCCA, are regarded as the most-sought-after accolade in critical communications. Celebrating innovation, excellence and execution in mission-critical communications, the ICCAs recognise products, organisations and individuals who push the boundaries of technological capabilities. This year’s awards ceremony, which attracted a record number of entries, consisted of nine categories, and these were assessed by an independent panel of judges. The event was co-located for the first time with Critical Communications World, a move that the organisers hope will make it easier for the far-flung critical communications community to attend and which has proved to be a success, given that the number of attendees was far beyond that seen in previous years, with 280 people there. Critical Communications Today’s editor, Sam Fenwick, opened the ceremony with a speech that highlighted the great strides that have been made in the field of mission-critical LTE. Fenwick was followed by the event’s host – Ken Rehbehn, principal analyst at Critical Communications Insights and one of the ICCAs’ 11 independent judges – who did a sterling job in leading the evening’s festivities. After almost three years spent overcoming technical obstacles and differences in operating procedures, Motorola Solutions, Airbus Defence and Space, along with MSB (the Swedish Civil Contingencies Agency, the operator of the Swedish Rakel network) and DSB (the operator of the Norwegian Nødnett network), have achieved interoperability between Norway and Sweden’s police and rescue teams. Until very recently, technical obstacles existed in both countries in terms of different technologies and communications procedures; over a period of three years, the partners worked together and presented the first linkage of the interoperable system in the Rakel and NødnettTETRA networks in November 2016. This marked the launch of the world’s first binational communication systems. Communications across the countries’ 1,619km-long border are improving the responsiveness and efficiency of their emergency services, and they are now collaborating with Finland to connect Virve to Nødnett and to Rakel, thereby creating a Nordic communication cluster. The judges described it as a milestone for TETRA and a great step forward in critical communications. Smith Myers’ ARTEMIS avionics communication and location system allows airborne search and rescue operations to locate missing persons and communicate with them in areas without the need for any public cellular networks. It operates using standard omnidirectional antennas, acts as its own cellular network and has been specifically designed for use in search-and-rescue helicopters. In the right conditions, ARTEMIS can locate a mobile phone from more than 30km away and during recent flight tests successfully located a phone buried under three feet of snow from a distance of 16km, while at 8,500 feet in a fixed-wing aircraft. On another flight test, a phone was located and communicated with at sea from a distance of 35km at a height of 3,000 feet. ARTEMIS has been specifically designed and configured to meet the extreme environments of the helicopter in the search and rescue role and can communicate directly via SMS “text” messages. This can be to specific phones or a broadcast message over a disaster area. Voice calls are also supported. All communications can be performed while simultaneously locating the person in distress. The judges were impressed by ARTEMIS’s potential and what it will bring to search and rescue efforts, with one judge stating that it will save lives. Radlink Communications Australia designed and delivered a TETRA network to Aurizon Rail, Australia’s largest rail freight operator. The network consists of 79 sites and covers 2,670km of rail network, and links 50 coal mines and four major ports. It replaced four outdated independent analogue systems and consolidated their user bases, together with train control, shunting, maintenance and wayside operations, into a single cohesive network. Network design and deployment took only 14 months and was carried out across difficult and challenging terrain, while keeping the old analogue systems (which had more than 25 channels) live to ensure a smooth migration. Radlink developed and customised a software package called Reveloc Plus, a platform specially designed to provide advanced functionality and unlock the full potential of voice and data combined. “This new radio system is one of the most technically complex and strategically important projects in Aurizon’s asset renewals portfolio initiative. This critical communications system will revolutionise our network as well as providing safer, more secure and effective technology for the control of all train movements and people across our Central Queensland coal network,” said Scott Andrews, Aurizon asset owner. The ICCA judges were struck by the way in which Radlink was able to address the many challenges it encountered while keeping to an extremely ambitious timetable. Diverse Power, an Electric Membership Co-operative based in Georgia, USA, acquired a TETRA system in 2013 and worked with PowerTrunk to expand it – which was completed in 2017. At the time of PowerTrunk’s submission, the Diverse Power TETRA network consisted of a system control node, a fully redundant and geographically remote back-up control node, and 50 site base stations providing coverage to approximately 60 per cent of the State of Georgia. Instead of limiting its TETRA coverage to its own area, Diverse Power has joined forces with other neighbouring electric co-operatives to provide TETRA coverage in their territories. This aided in the co-operatives’ response to the hurricanes that struck Georgia in 2017. Through the use of the shared system, the member co-operatives were able to deploy personnel and resources to lend support to their neighbours, while still maintaining full access to the TETRA services and features with which they were normally accustomed. Harris County’s Sheriff’s Office and Emergency Medical Services also use the network, and TETRA’s voice clarity played a key role in their decision to do so. Diverse Power’s network is also used by four police and 10 fire departments in Georgia. The judges complimented Diverse Power on its “great and pioneering use of TETRA in the US”. The Agnico Eagle LaRonde underground mine in Canada deployed a private LTE network for its Zone 5 project, which is the deepest mine in the western hemisphere. It used Athonet’s solution, which was installed by system integrator AMBRA. The system is fully based on 3GPP standards and compatible with all LTE standards-based mobile operator networks, bands and off-shelf devices. It has also been built with support for mission-critical LTE (MCPTT, 3GPP Releases 13 and 14) and 5G features. A fleet of 500 smartphones is complemented by a complete mobile core (EPC and IMS) system that supports push-to-talk and push-to-video over LTE. The system has enabled the mine’s supervisors to receive information from their workers in real time, when it had previously only been exchanged during shift changes. Athonet’s Mobile Core is a completely in-house, 100 per cent software-based solution, which is software upgradable to 5G and can scale from handling a handful of users to millions of users on low-footprint hardware. The web-based GUI and APIs make for simple management and operations that differentiate it from other solutions. Control plane and user plane functionalities can be distributed between central and edge clouds or hardware nodes to enable hybrid-cloud, fog-computing or mobile-edge-computing deployments. Athonet’s IMS is highly differentiated as it allows localised deployment of VoLTE and other services without the need for a large, centralised telco-type infrastructure. It was also the only IMS that was able to support the first ETSI MCPTT Plugtests event that took place in June 2017. The judges described the project as an “impressive, innovative and unusual deployment”. The Tactilon Dabat is the first device to combine a smartphone and a full TETRA radio. It provides mission-critical users with the resilience and reliability they have come to expect. It has a large clear display, a professional push-to-talk key, excellent voice quality, a long-lasting and changeable battery, together with an intuitive interface. Like a standard TETRA radio, it can work in direct mode. The device is IP65- and IP67-classified for dust and water and has been tested for free-fall from a height of 1.5 metres according to MIL STD 810G. Featuring a large and robust touchscreen, the Tactilon Dabat also has a microphone and speaker which are voice-optimised and waterproof. The Tactilon Dabat is supported by the Airbus SmarTWISP programme for application developers. About 100 companies have already joined the programme, which is working to build a professional app ecosystem, and Airbus is looking for new ideas to enrich it further with Critical Apps Challenges (hackathons) around the world. The judges described the Tactilon Dabat as an “excellent example of an evolutionary approach to handset design”. Project Green Light Detroit is the first public-private-community partnership of its kind. It allows local businesses to install and maintain high-definition video surveillance cameras that live-stream footage back to Detroit Police Department’s Real Time Crime Center. There it is received, monitored and analysed by operators using Motorola Solutions’ CommandCentral Aware software to help address crime, boost responsiveness to incidents and capture video evidence to support prosecution in cases of criminal activity. This is accomplished using overt cameras in public places. The project has resulted in a 23 per cent reduction in crime (on average) at the locations in which it operates, including a 44 per cent drop in the number of car-jackings. It has also allowed criminals to be caught in hours, rather than days or weeks, due to its ability to clearly capture visuals of suspects. These improved public safety statistics come on the heels of end-of-year reports acknowledging the dramatic decreases in violent crime to levels not seen since 1966. The judges were impressed by these figures and the project’s innovative use of video and data. Thomas Roth was hired at the age of 16 by the Swiss company Schindler to develop embedded software. In 2010, he published his private security research on using a new technology on the Amazon cloud for encryption-breaking, gaining him global recognition. At the age of 20, Roth published an attack on the most common point-of-sale/card-payment terminal in Germany and was even able to load a game of Pong onto it. He has since published his attacks on TrustZone, and researched secure communication platforms such as Protonmail, SpiderOak and Tutanota. In 2018, Roth was named one of the ‘top 30 under 30 years of age in technology’ by Forbes magazine. One ICCA judge expressed their gratitude that he is working for the white-hat side. David Chater-Lea has spent more than 35 years of his career in mission-critical communications, and has tirelessly supported the development of standards and the needs of the industry in ETSI, TCCA, CEPT and 3GPP. He has been a key member of the TETRA standards community since 1994, when he joined what was then ETSI RES6 WG6, which designed the TETRA security standards. He continues in his roles as chairman of WG4, vice chairman of WG6, vice chairman of TCCE and vice chairman of 3GPP SA6. 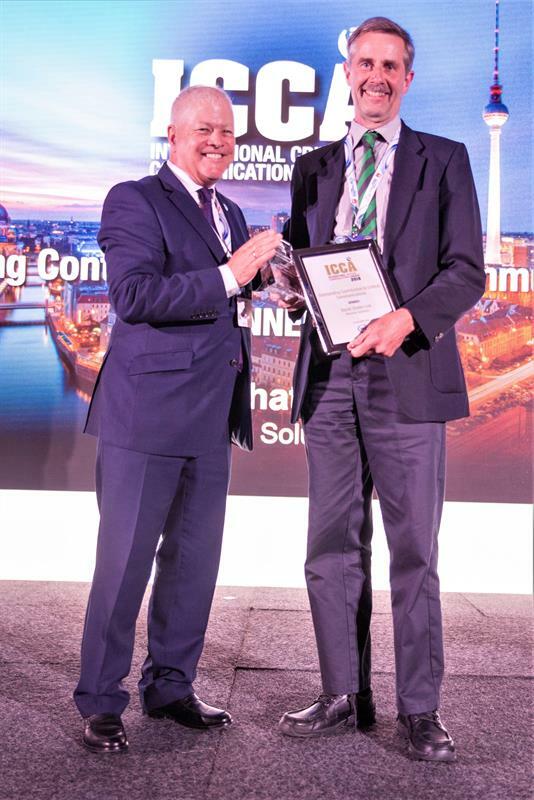 The ICCA judges commended Chater-Lea for his outstanding and long-term contribution to mission-critical wireless standards, with one saying that “it is hard to think of anyone who has been more influential in creating the European standards we have today”. The evening finished with Adrian Scrase, ETSI’s CTO, presenting a special award on behalf of 3GPP to TCCA’s chief executive Tony Gray, in recognition of the role that TCCA and the Critical Communications Series of events have played in championing the interests of mission-critical users all over the globe, on the latter’s 20th anniversary. We at Critical Communications Today would like to congratulate all the winners and finalists and are looking forward to seeing who will be shortlisted next year. As ever we continue to be impressed by the amount of innovation and passion in the industry. Don’t forget you can sign up on the www.criticalcommsawards.com home page to receive a notification when the 2019 awards are open for entries.